The National Secular Society was founded by Charles Bradlaugh in 1866. A political polemicist and former army officer, Bradlaugh believed that religion was a retarding influence on human life and society, advocating 'free thought' as an alternative. As a young man, he had had clashed with his parents over his athiestic views, and he would continue to clash with established churches throughout his adult life. Particularly controversial were his views on contraception. Bradlaugh believed strongly that without contraception many women were trapped in an unending reproductive cycle, bearing so many children that it left whole families in continuous poverty. 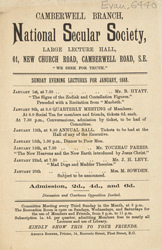 Bradlaugh ran as an independent candidate in the 1880 general election, becoming Member of Parliament for Northampton. His refusal to take the Oath of Allegiance to the queen or to God saw him expelled before he could even take his seat. In 1882, he was sent to prison on the grounds of "obscene libel" in his magazine 'The Freethinker'. In 1883, he was again elected to parliament, but was prevented by the Tories from taking the oath. He managed to vote three times before being expelled again and fined £1,500. He finally took the parliamentary oath in 1886, serving as an equally fierce critic of the Liberal government and their rivals the Conservatives. He was particularly outspoken on the subjects of Irish Home Rule and British foreign policy in the Middle East. He died in 1891, and was buried in unconsecrated ground before 3,000 onlookers. The British Secular Society survives to this day.